Ray Sands Glass is excited for the Rochester Home and Garden Show next weekend, March 26th and 27th at the Rochester Riverside Convention Center. We have lots of great residential services to discuss this year for your home’s windows and other interior glass as well. This year we have seen a lot of interest in our residential window film, with people becoming more aware of the amount of energy being exchanged through their windows. Some are looking to keep out the sun’s harmful UV rays, and some to reduce their monthly energy bills (and therefore their carbon footprint.) Whatever their motivation, we are delighted at the opportunity to discuss the benefits of residential window film, answer questions and show off some of our most popular home products! Another residential window improvement service that we have seen a growing interest in, is our “Get the Fog Out” window restoration process. This technique clears the existing window of moisture and uses specially made valves to prevent future moisture buildup, while preserving the insulation value of a double pane window. 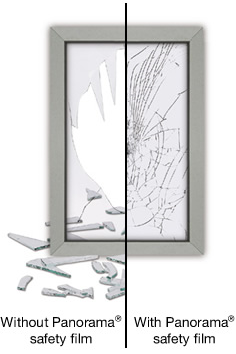 All without the hassle, expense or wasted glass of of a window pane replacement. This year we will also be presenting a display of some of our work with framed and custom mirrors, which we haven’t featured at home shows in the past. But we have really enjoyed this more artistic aspect of working with glass, and some of our recent projects show how fun and beautiful it can be to think outside the box! And of course we will be exploring some of the home uses for Aquapel, everyone’s favorite water repellent for glass ,on exterior windows and glass shower doors. So while you are out next weekend perusing the variety of home improvements, don’t forget about your windows! Hope to see you there! As we discussed in the last post, residential window tinting can be an effective way to save energy, which has become so important as people realize that the value of our energy goes beyond the dollar amount on our monthly bill. But window film can have several benefits to the homeowner, outside of those offered by energy savings. 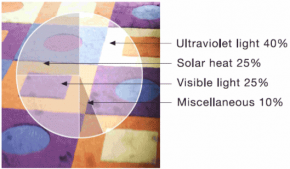 The solar reflection properties that help keep your energy bills lower, are also protecting your furniture and flooring from the sun’s harmful rays. The sun can often be more damaging to antiques, artwork and fine rugs than the wear and tear of everyday life. The main causes of fading are shown in the chart to the left – and as you can see, solar energy sources account for a big chunk of the discoloration on some of our most valuable possessions. Residential tinting film can also provide another type of protection that many people don’t consider a risk until it happens – home window breakage. We expect a certain level of risk in car window breakage, that’s why the glass on your automobile is either tempered safety glass, or laminated windshield glass. But most residential window glass is just like any other flat glass, when it breaks, it makes large shards and tiny glass splinters. When applied to the inside of single or double pane windows residential films can help prevent these shards of the interior glass from scattering all over due to impact damage. Whether the damage to the window was a kid’s home run ball or a loose branch in a storm, window film can prevent injury or material damage due to flying glass. Home tinting film can also hold the glass together in case of intentional breakage, making it harder for anyone to maliciously gain access to your home without serious injury to themselves. Residential window tinting provides a line of protection against everything from faded furniture to flying footballs, on top of the more familiar energy savings. It’s a wonder more people don’t consider this one of the first options for residential window improvements – it can save your money, your belongings and maybe even your self!